When fighting Hammer Eggman (トンカチエッグマン), the Aquatic Ruin Zone boss, the first things noticeable are the two totem poles that rise up out of the ground with openings on the faces' mouths. 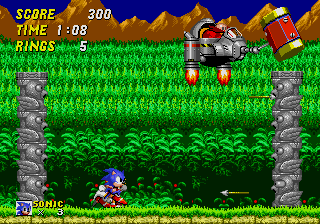 Next, notice Eggman inside another hovercraft, this time with a giant hammer attached to the front of it. Eggman will stay above the two tall poles, just out of your reach. That being said, Eggman will fly back and forth, smacking both totem poles with his massive hammer. Upon doing so, arrows will be propelled out of the mouths and stick into the corresponding section of the pole across the screen. The goal here is to use the arrows as stepping stones to reach Eggman. You may either hit Eggman directly by jumping up from the arrows, or hop onto the top of either pole and bounce off the pole onto Eggman and back, watching for his hammer (it won't crush you, but it will take your rings). You may also jump onto the pole while it rises from the ground at the beginning of the fight. When playing as Knuckles, it is possible for the game to continuously give you arrows in topmost and/or bottommost slots of the totem poles. Due to Knuckles being only able to jump either from the ground up to the top-but-one or from bottom arrow to top slot, this results in not being able to win the boss fight without the loss of a life. If you can get on top of the left pole, you can spindash (fully charged) into Robotnik AND return to the pole. This doesn't work on the other pole. This makes a very cheap tactic to win, but it is used by speedrunners to defeat this boss quickly.